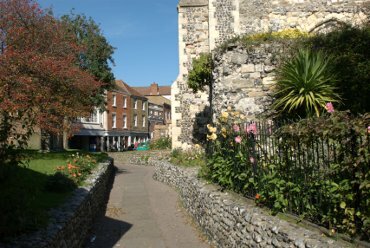 Sandwich is Kent's hidden gem. Situated mid-way between Margate to the north and Dover to the south at the eastern most part of the county it seems to be little known by tourists but is just the sort of quaint little town that tourists would love! 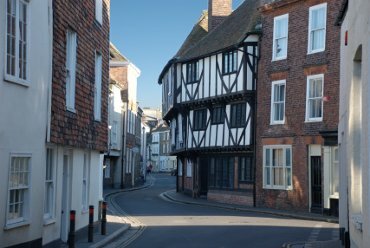 You can see why in this picture of one of Sandwich's main thoroughfares, Strand Street. This is the main road to and from Canterbury at around 5:00 PM on a Sunday afternoon. It was a little busier on a Monday but, generally, there is not a lot of traffic in the town. Sandwich is a maze of narrow little streets and alleys which are sometimes confusing but always fascinating. We stayed at the The Kings Arms Hotel for the duration of our stay in 2010. 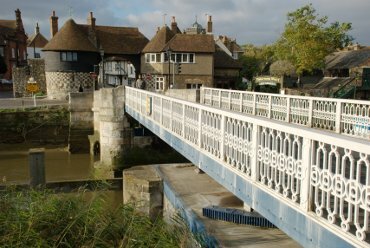 At the eastern end of Strand Street you will find the road to Ramsgate leading out through the arch of the Barbican and across this swing bridge. Part of the mechanism as visible at the bottom of the picture below the bridge. This view is looking from the northern side of the River Stour back towards the town. The river is also known as the Great Stour and is the same river that runs through Canterbury 12 miles to the west. Looking through the archway of the Barbican along High Street past the junction with Strand Street, on the right, showing some of the timber-framed buildings which are sprinkled so liberally across the town. 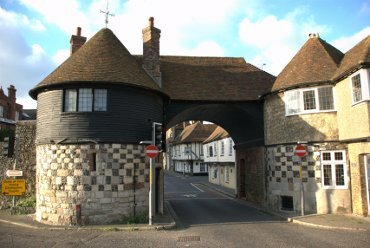 The Barbican, built in the 14th century, was one of the gates in the old town wall. This attractive little path runs from St. Peter's Street past the west end of St. Peter's Church into Market Street.